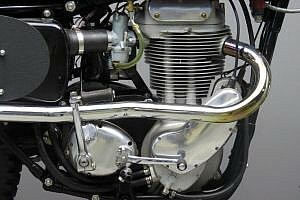 The 500 cc G80 first appeared in 1936 with engine dimensions of 82.5 x 93 mm. 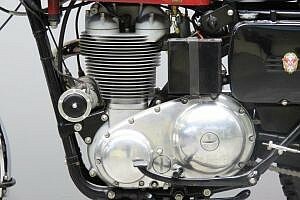 It had a twin port head, dry sump lubrication, exposed valves, Burman gearbox and a frame with twin down tubes. At the outbreak of war some of these features had changed: single down tube frame, single port head and full enclosure for its hairpin springs were now specified on the G80. After the war the G80 engine design was constantly upgraded, eventually becoming an over-square 86 x 85.5 mm all-alloy design. 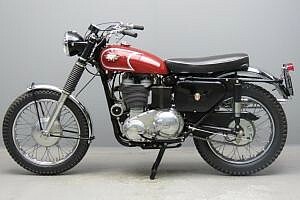 Associated Motor Cycles (AMC) established a formidable reputation in off-road competition in the 1950s, winning the British 500cc Moto-Cross Championship on four occasions with the relatively lightweight and well-handling G80 scramblers. In the USA, desert race victories by riders such as Walt Fulton and Bud Ekins ensured a healthy demand for AMC’s Matchless G80CS and AJS 18CS scramblers. 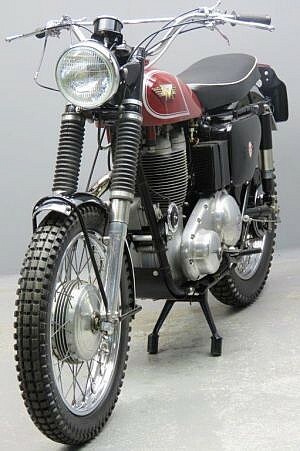 Housed in a rigid frame with Teledraulic front forks, the ruggedly built overhead-valve engine drove via a four-speed gearbox. 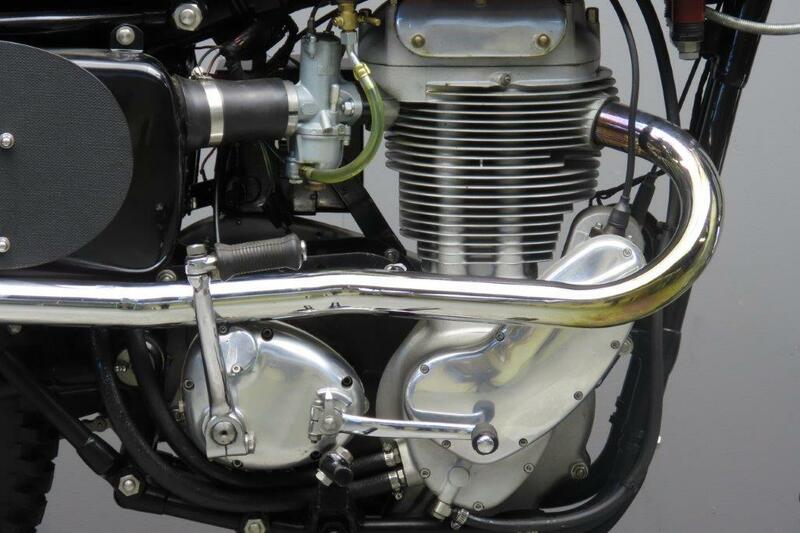 Hairpin valve springs were adopted for 1949 and a swinging-arm frame introduced, the latter initially for export only. 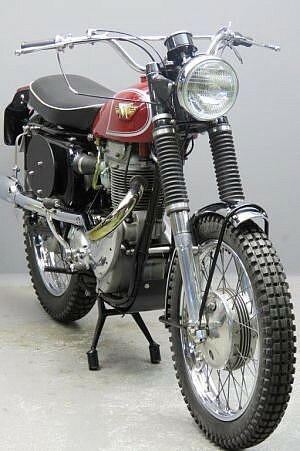 Models so-equipped got the suffix ‘S’. 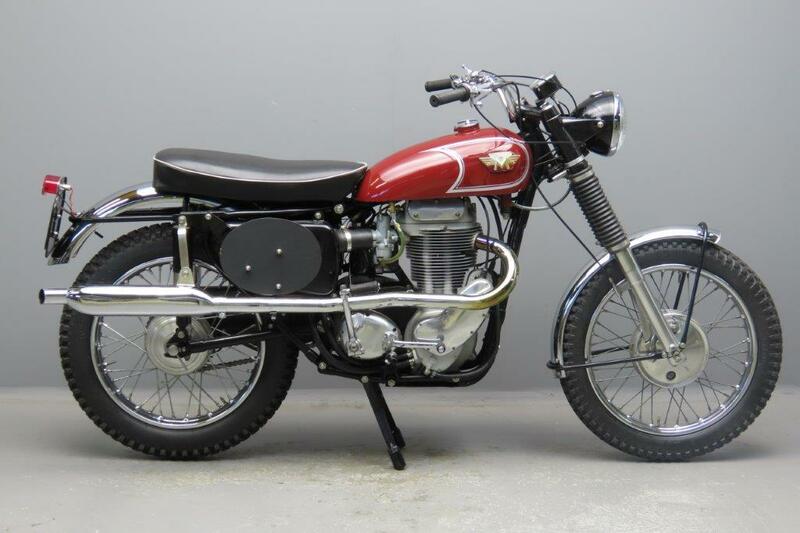 A new duplex frame appeared for 1960 and there were further engine improvements as AMC continued to develop its four-stroke scramblers to the end of production in 1969, but by then the days of such heavyweight machines were at an end. New for the 1966 model year were a new gear-type oil pump, even more improved bottom-end and extended Teledraulics forks. 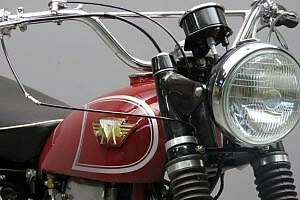 The petrol tank is finished in candy apple red and the bike is fitted with a Lucas Competition Magneto. This Dutch-registered iconic scrambler has been restored and is in excellent condition.